Mixed- up sequins, velvet and clashing colours – a small capsule range embracing Halpern’s signature couture embellishments, overt – femininity and extreme Studio 54 glamour. New York-born, London-based designer, Michael Halpern, won the British emerging talent award for womenswear at the Fashion Awards, in December 2017. This fabulous range is the perfect way to inject some fun into your party wear and hit the disco floor in a blaze of colour and sequins. Elevate your evening look with this high-shine sequin asymmetric dress. Detailed with a plunging v neckline, zip at back and ruched waist - creating a sophisticated wrap effect. This all over cheetah print in a hot pink shade will create a look that is like no other. 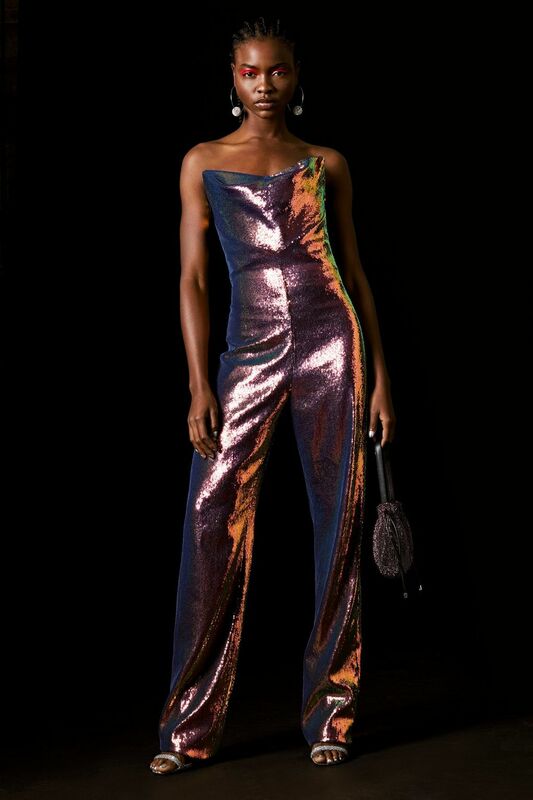 Celebrate the party in style with this showstopping holographic jumpsuit. The sparkling sequins shine different tones under dance floor lights and will be sure to impress any guests or friends. Taking inspiration from the disco era…it’s all about great times in this great number. 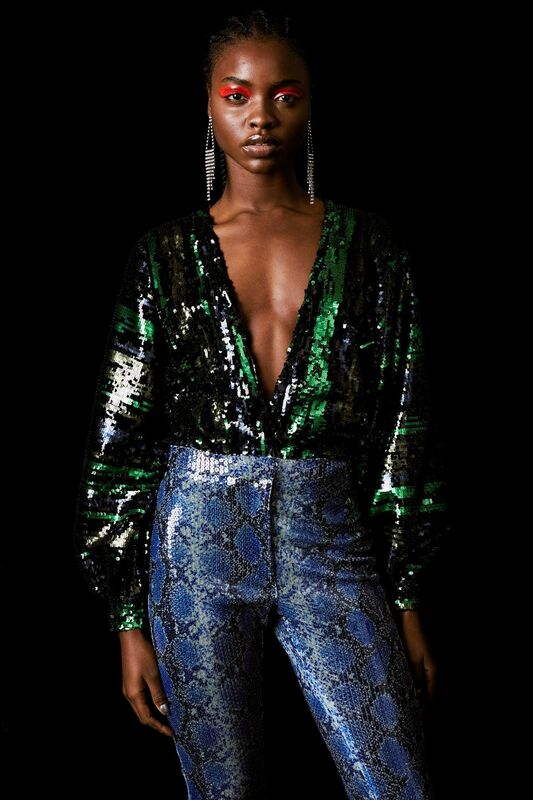 True to Halpern’s signature sequin style, these trousers feature a dramatically flared hem. Tap into the animal print trend with this statement snakeskin design. You will be sure to sparkle the night away in pure style. Clash themes, designs and textures with this plush black velvet and shining sequin cold shoulder dress. Detailed with asymmetric straps and a spliced panel, the look and feel of this outfit is pure ladylike luxe. Double the design, double the drama. Add a sprinkle of glitter to your wardrobe with this sequin bodysuit. Channel a modern appeal with this all over striped pattern with plunging v neckline. The fusion of green, black and gold creates a stylish evening appeal. We adore the dramatic and theatrical long bishop style sleeve. Get ready for any event with these super statement plush velvet trousers. Featuring faux pockets, belt loops and a flared hem, it’s all about the details. Make an eye-catching entrance with this neon pink design for a lasting memorable impression. Everyone needs a bodysuit in their party wardrobe. 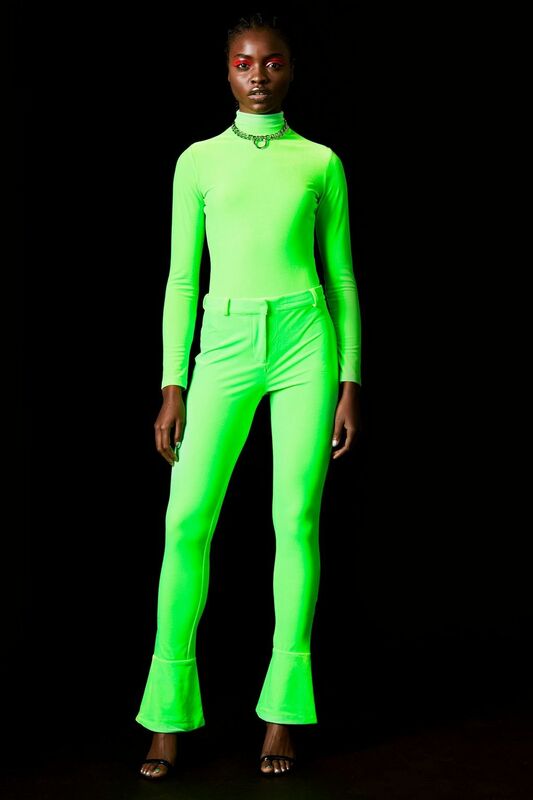 This bright and bold piece will light up the room in eye-catching neon style. Detailed with a high neck, long sleeves and ultra-soft velvet fabrication, you will look glam in green. 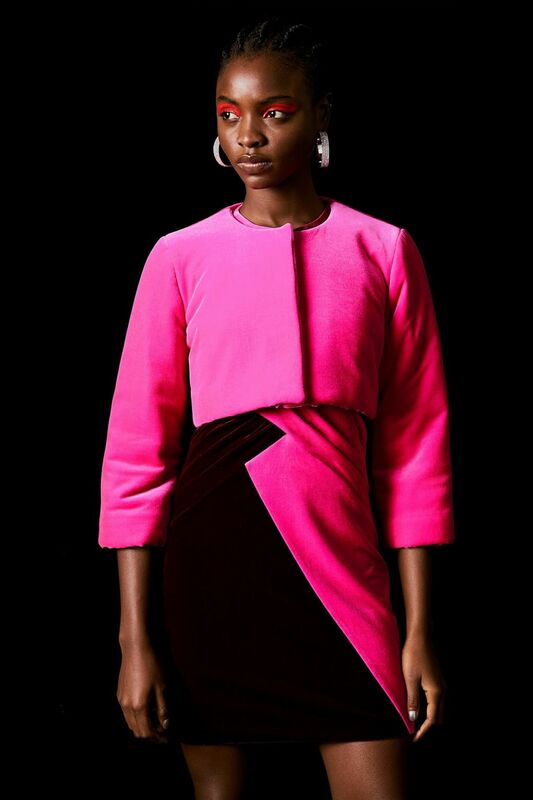 Light up your evening look in style with this sumptuous plush neon pink velvet jacket. The luxe fabrication is a thick and padded texture, featuring red and pink cheetah print lining. Designed with a crew neck, detailed with popper fastening and cut in a cropped shape, add this new dose of texture and high-intensity colour to be the life of any party. Make a statement at any party or event with this marble effect long sleeve silver dress. Made in a soft fabrication, detailed with a plunging v neckline and featuring an asymmetric hem, this bold design will turn heads. More is definitely more in this fashionable approach to dressing. Create a dance floor-ready look with this printed top in beautiful blue. This star piece is cut with a high neck, fitted structure and flared long sleeves with split back. You will be sure to create a high-glam aesthetic that creates stand-out style.